Gospel music singer - Ani Light is out with the remix of the thanksgiving song off her album - 'Amanam'. The uptempo praise is expressive of gratitude to God. It celebrates love with such a joyful mood and it's significant to the theme of abundant life painted by the lyrics. 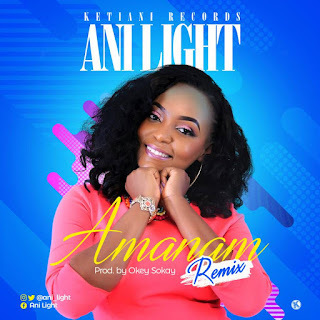 Ani Light is an anointed songwriter, singer and worship leader. Her first single titled - 'All You Wanted' was recorded at the age of 9. In 2013, she launched her debut album titled - 'My Greatest Treasure' which included singles such as 'Unto Your Name', 'Amanam', 'So Glorious' amongst others. The Gospel music artiste is serving in Christ Embassy church. Her music has ministered to many, bringing joy, healing, encouragement and strengthening faith. She is greatly motivated by the desire to see her songs inspire people to praise and worship God. She also desires to inspire youths all around the world to love and serve God.